Posted on August 10, 2015 by revivewa	in Faith in Action, Opinion and tagged 1, asylum seekers, detention, refugees. Part of what makes our nation and our society so great is the Australian concept of a ‘fair go’, along with the willingness to ‘lend a hand.’ It is part of our core business as churches and community organisations to care for the vulnerable, for the stranger. Indeed you could suggest it is part of every Australian’s DNA to care for those in need. It is with great sadness then that we must admit that we have neglected to lend a hand to asylum seekers and we are not providing them with anything closely related to a ‘fair go’. Instead our detention policies are actually adding distress to despair – and now death as well. Mohammad Nazim Najafi, aged in his mid-twenties, died a lonely death last Friday evening. The Coalition for Asylum Seekers, Refugees and Detainees (CARAD) has been working with a number of churches and community groups visiting asylum seekers in Yongah Hill Immigration Detention Centre (IDC), on the outskirts of Northam since the centre was opened in 2012. We have come to personally know many of the asylum seekers who are detained there, with friendships formed and affection shared. Their stories are all unique, and yet share similar threads – longings for loved ones, memories of war and persecution, journeys of peril, and always, a desire to work, to contribute and ultimately give back to Australian society. So it is with troubled hearts that we share this reality: detention and the length of time it is taking to complete the claims assessment process is killing our friends. We have slowly watched the despair rise to levels we did not dare believe it could go. Just last week the debilitating hopelessness that indefinite detention brings contributed to the death of a young asylum seeker at the Yongah Hill IDC. In the past year two men with Bridging Visas have taken their own lives in Perth. We cannot let such tragedies occur so quietly. We invite you to share our dismay, our outrage and demand another way. The halls of these detention centres and the processes of the Department of Immigration and Border Protection (DIBP) have too many shadows for a democracy such as ours. 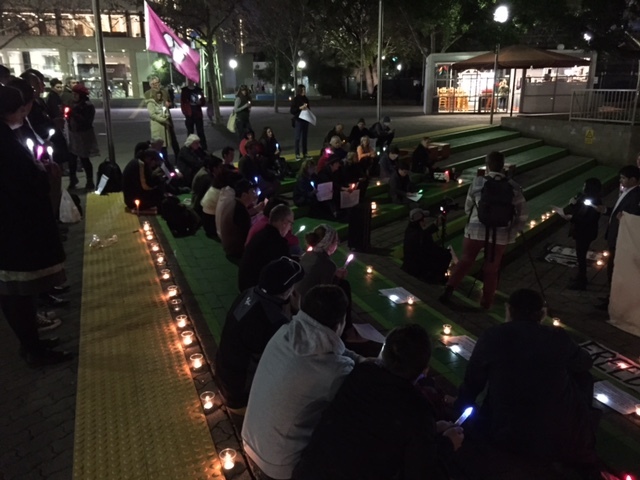 A candlelit vigil was held for Mohammad Nasim Najafi on Friday evening 7 August in the Perth Cultural Centre. Members of the community gathered to pay respects to Nasim’s life and call for an end to the unjust imprisonment of refugees and asylum seekers in Australia. Combined with the endemic deterioration of mental health, the asylum seekers at Yongah Hill IDC have been forced to co-exist with a separate cohort of people detained with immigration ‘compliance’ issues, some of whom have criminal convictions, introducing a culture of fear and violence not previously present. There have been ongoing reports of asylum seekers being threatened, bullied and beaten by this group. CARAD believes the DIBP are abrogating their duty of care to asylum seekers, most of whom are traumatised and mentally fragile following years of detention, by placing them in this dangerous environment. On top of these pressures the health services have been drastically reduced so that health care professionals are only on site between 9 and 5 on weekdays. No doctor or nurse was on duty when Nazim died. Out of hours the health needs of asylum seekers are met in the first place by Serco guards, which is an unfair burden on them also. In a further blow to the tenuous morale of the asylum seekers at Yongah Hill IDC, around 90 were given letters last week notifying them that they were being transferred to the Darwin Wickham Point Immigration Detention Centre – some were moved the next day, the others are waiting for a knock on the door any time now. This has created great distress to those who have received social support and assistance from CARAD visitors and others, including their legal representatives, for several years. This social support is very important for their mental wellbeing and indeed access to legal representation is a basic right. This surprise removal also forces them to re-explain their stories, reliving their trauma yet again to a new batch of case workers, medical staff, and others. We cannot underestimate the negative impact this has on their mental health. It was in this uncertain, tense, and toxic environment that late on Friday night a young Hazara man named Mohammad Nasim Najafi died, reportedly of a heart attack. We have been reliably informed that this young man had been assaulted recently by ‘compliance’ category detainees and moved to a different compound. He was not allowed to leave the compound to eat or exercise with others. He complained of being unwell after being moved to the new compound and there is concern he may not have been appropriately treated and may have self-harmed. The uncertainty and complex circumstances surrounding this sudden and unexpected death means that an autopsy and Coronial Inquiry are imperative. There is nothing fair about how any of this played out. We did not care for this innocent young man. He fled the Taliban, seeking the protection of our Government and now he is dead. Whether asylum seekers flounder indefinitely in detention centres or are burdened with fear at facing deportation back to danger, the levels of despair are high and mounting. Between the tension of being detained in an unsafe environment and being held in limbo, beholden to the mysterious workings of the DIBP, our asylum seeker friends are hurting. They have committed no crime and yet we are prepared to keep them trapped in indefinite detention and watch as life slowly fades from their faces. We are a bright, creative, compassionate people. We can and must do better. Please, we ask that you join us in demanding another way from our Government. Kris Halliday is the Chair of the Coalition for Asylum Seekers, Refugees and Detainees (CARAD). Here he also writes under the endorsement of the Ecumenical Social Justice Roundtable, comprised of the Social Justice Board of the Uniting Church in WA, the Social Responsibilities Commission of the Anglican Diocese of Perth, The Salvation Army, the Quakers, Baptistcare, the Council of Churches, and the Justice, Ecology and Development Office of the Catholic Archdiocese of Perth. This is a disgraceful state of affairs. We need to stop the boats but once we have people in detention they need to processed quickly and allowed to seek gainful work and education. the way we treat people is likely to make them terrorists. I met many families on Christmas island . Some who already had families in Australia. The Royal Australian College of Physicians has produced a statement condemming the treatment of asylum seekers. Jacqueline Scurlock , Paediatrician. OAM.